NOTE: 50% discount for first 100 customers is now available! Renty is a functional car rental WordPress theme which helps you to create a fast and clear car rental business website. 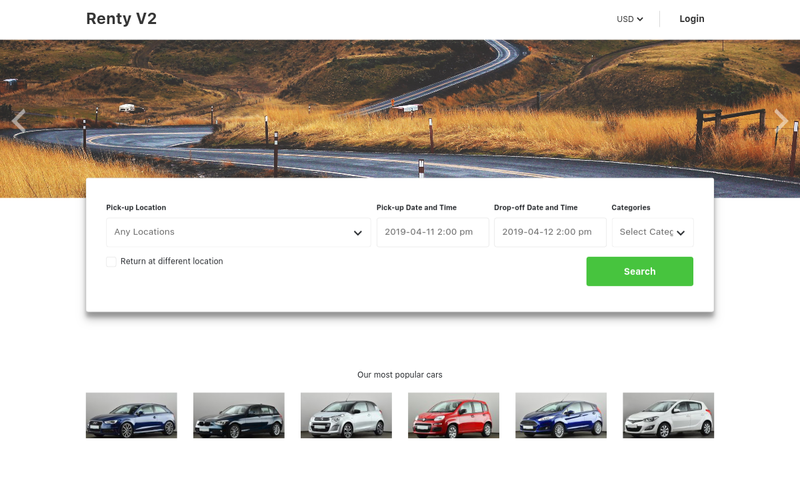 Renty theme and Car Rental plugin installed allows you to add and manage an unlimited number of cars, extras, slides, and widgets. It offers purpose oriented style with all the necessary features car rental website needs. Simple and efficient WordPress theme for car rental businesses, shops, and car service owners. Create your car rental website today! Renty theme requires Car Rental V2 plugin to be installed. Add and manage cars, extras, manufacturers, vehicle types etc. We recommend you to download and install these plugins (and some may require a purchase). Images used in this template can be found at http://unsplash.com/ (licensed under CC0: http://creativecommons.org/choose/zero/). *NEW : The ability to load demo data has been added. *Release date of Renty V2 Theme.